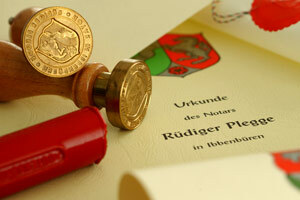 The notary Rüdiger Plegge is as an administration of justice organ the independent holder of a public office. His duties lie in the field of the precautionary administration of justice. He is above all responsible for recordings, such as contracts for the sale of real property, the creation of land charges and mortgages, division declarations in respect of residential property, wills and contracts of inheritance, matrimonial property agreements and agreements regarding the legal consequences of divorce. In the company law field he is for example responsible for the recording of articles of association or shareholders’ agreements, for instance for a limited liability company or a limited partnership and indeed also for a joint-stock company. When exercising his office, the notary is the impartial and independent adviser of the involved parties. On the occasion of recording legal transactions, the notary has examination and instruction obligations towards all involved parties regarding the legal situation. The notary is, of course, obliged to maintain secrecy on all recorded matters.